Me and my mother outside the Icehotel. 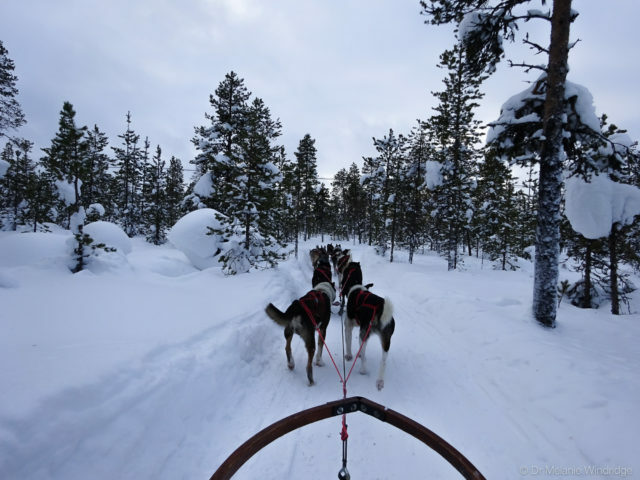 I’m just back from a short trip with Discover the World to Abisko and the Icehotel. 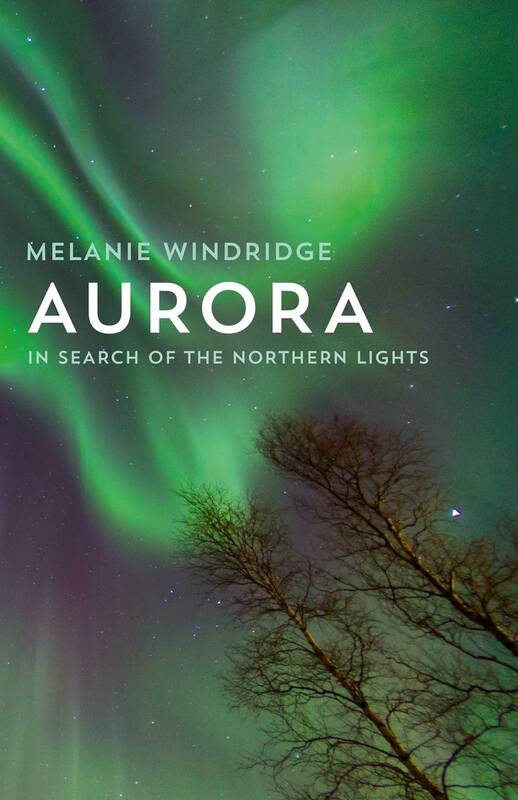 I was working on this trip – I was the aurora expert for the group – but I also took my mother along with me for her first experience of the Arctic. My mother very much enjoyed the Icehotel, including the night in the cold room. She thought it was an interesting experience and I thought it gave her an insight into what it’s like for me camping in snowy places – though without the confined space, getting dressed lying down or the cold morning dressing and cooking routine. 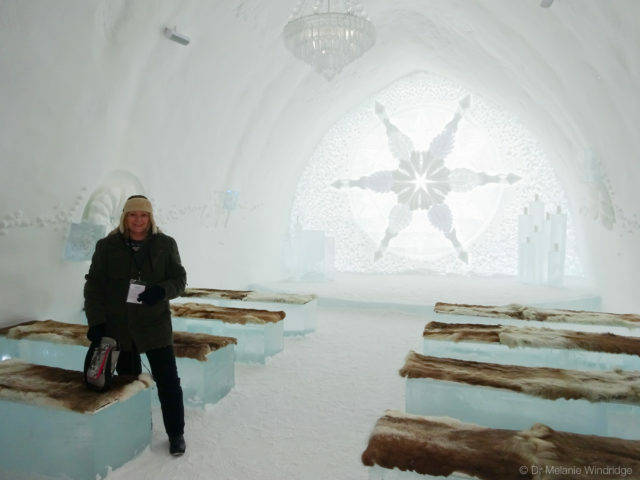 My mother, Sheila, in the Icehotel ceremony room. We also enjoyed the dog sledding and snow mobile excursions, and of course I managed to squeeze in a quick bit of cross-country skiing! 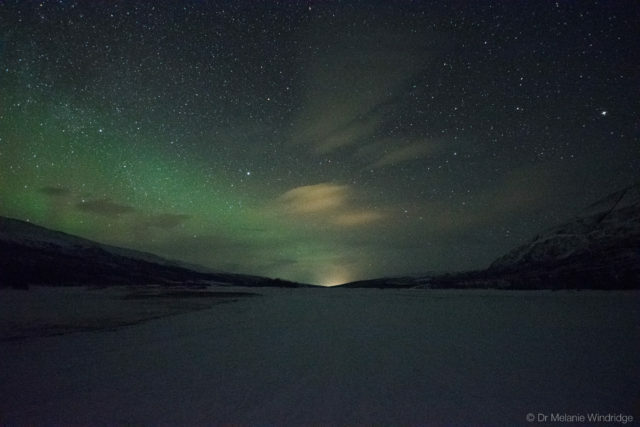 On the last night, when we were in Abisko, we caught a glimpse of the aurora. It appeared as we were getting dressed up for our snowmobile trip into the national park. 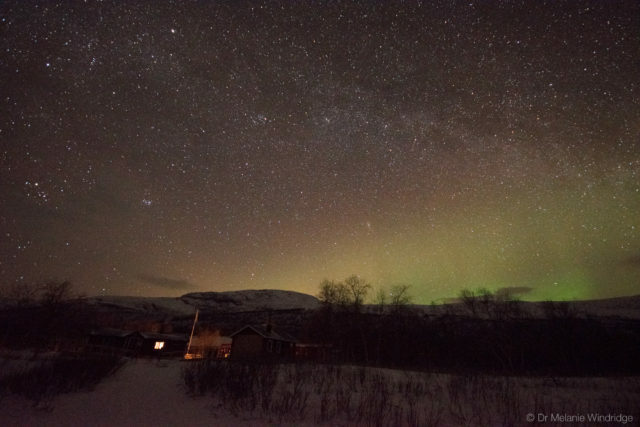 We rushed out and saw it clearly, with structure and colour and curves, but it didn’t last for long and the spectacle was diminished slightly by the light around the Abisko Turiststation. But I was so pleased that we had finally seen some aurora after two cloudy nights, and even more pleased that my mother had seen her first aurora. I didn’t manage to take a photo, but here’s one from the Aurora Sky Station live camera. 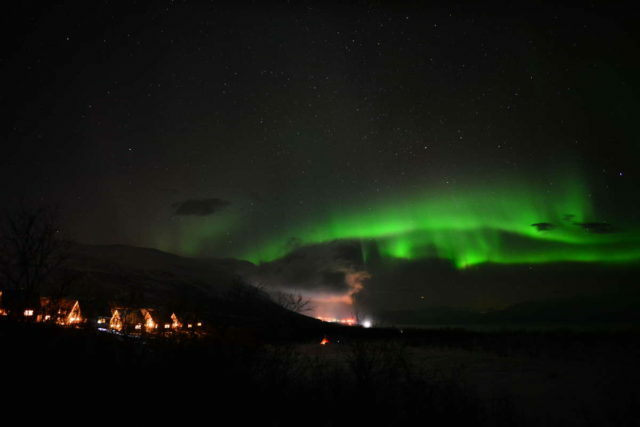 Aurora seen over Abisko on 12th February. Photo courtesy of the Aurora Sky Station website. I did take some photographs when we arrived at the Abiskojaure Mountain Hut on our snowmobile ride. This hut is on the famous King’s Trail, or Kunsleden, which stretches over 400 kilometres through the Scandinavian Mountain Range between Abisko and Hemavan. By this time, unfortunately, the aurora had settled to a faint colourless glow – visible only to the camera – but the stars out there were incredible! Pale green aurora over the Abisko National Park. The Abiskojaure Mountain Hut on the famous King’s Trail, with a smattering of aurora and some fabulous stars. This was a lovely, action-packed trip. 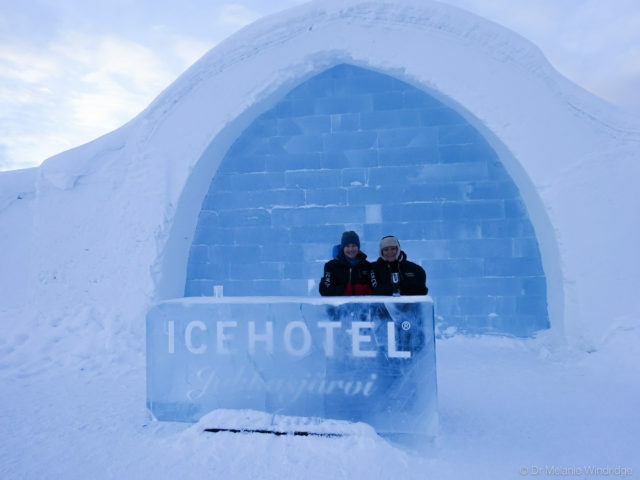 All the guests, including my mother, seemed to enjoy the excursions and were impressed by the Icehotel. 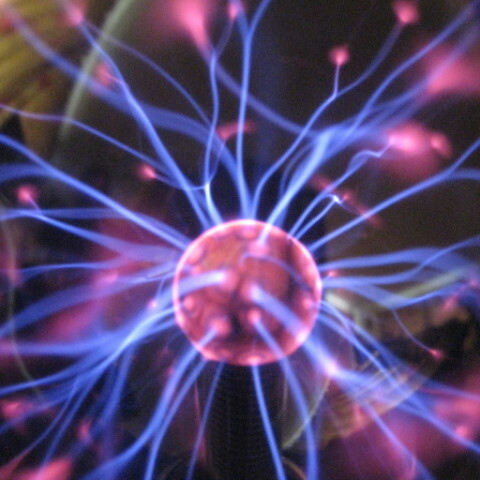 As always, I enjoyed talking to the guests about the aurora, plasma and fusion energy, and only wished the group could have stayed together a bit more so I could have got to know people a bit better and answered more questions. The Icehotel is quite big and the excursions run, overlapping, throughout the day so guests disappeared into the crowd. At Abisko the group kept together more and interaction was easier, which I liked. Of course, I wish I could have stayed longer, but I was grateful to be able to try some new things in the Arctic and to share this beautiful place and the magic, if elusive, aurora with new people.